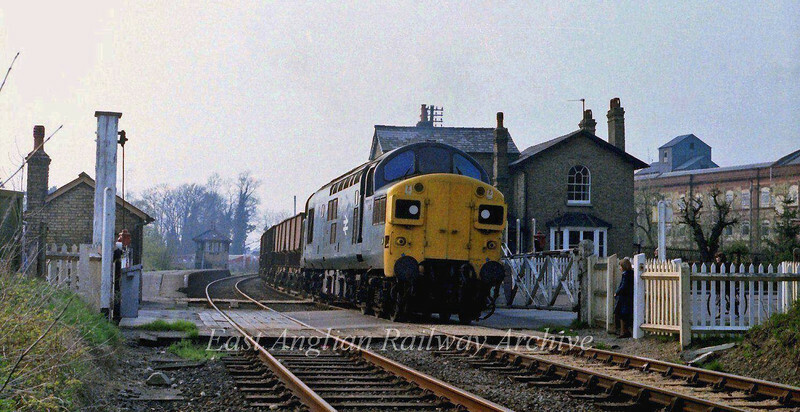 37026 departs Histon with sand from Fen Drayton on 24th April 1978. A piece of local history here. Between the right hand eave of the station house and the grey building on top of Chivers factory to the right is a barely perceptible small black protrusion. This was a steam powered whistle with a tone of around 800 Hz which apparently served as an "all clear" signal for enemy action during the second world war. Chivers used it after the war to announce the start and end of shifts. It went off at 0800, 1300,1345 and 1700 and could be heard all over the village. It was always interesting to watch the spurt of steam issuing from the building at these times. It was locally known as the buzzer. All long gone now of course.